I first heard about Hotham Sound when I took a zodiac tour to Princess Louisa Inlet with West Coast Wilderness Lodge two years ago. However it wasn't until recently that I got the chance to go there. Again I took a guided tour with West Coast Wilderness Lodge. Michael, the skipper of the zodiac and Kathryn, our kayaking guide. 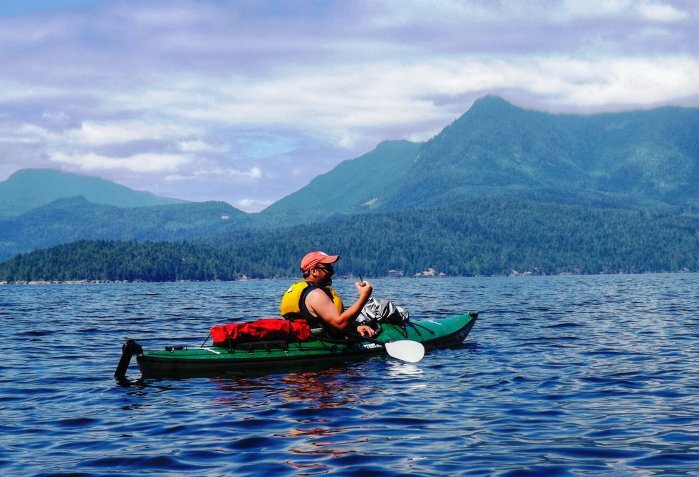 I haven't had much kayaking experience or been in a kayak for seven years, so I was a little nervous about taking the trip. I talked to Kathryn ahead of time and she reassured me that it would be fine. The other two members of our group were a young couple on their honeymoon and they just wanted a relaxed outing. Turned out she was right, it was more than fine. It was fantastic! We headed out on the zodiac around 10 am for a 15 or 20 minute trip to the entrance to Hotham Sound where we slid into our kayaks to continue the adventure. Just starting out! We had perfect weather. 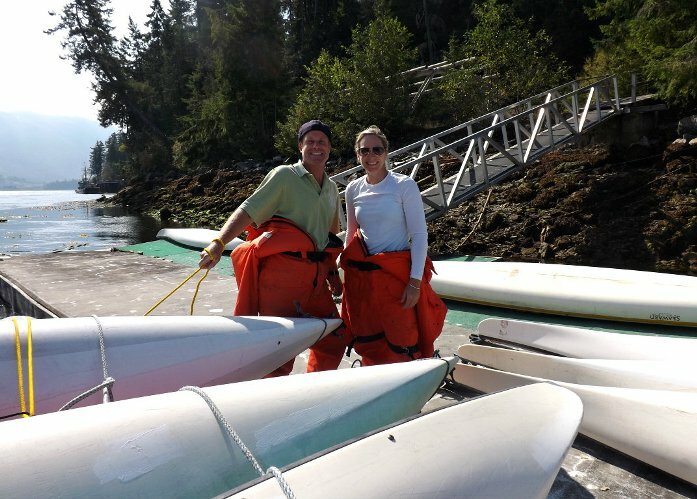 We paddled along the coastline at a very relaxed pace (much to my delight). One of my kayaking companions was really excited to find oysters and eat them raw along the way. Kathryn managed to sneak a lemon out of the restaurant and brought it along. He was collecting oysters, shucking and eating them, while paddling along. Just a note - he and Kathryn very carefully checked to make sure it wasn't red tide when eating shellfish can have very serious consequences! We paddled along for about three hours exploring and collecting oysters along the way. We stopped for lunch at a small island that Kathryn called Lunch Island. We never did find out the actual name :-) Lunch turned out to be the best and most decadent picnic I've ever had. 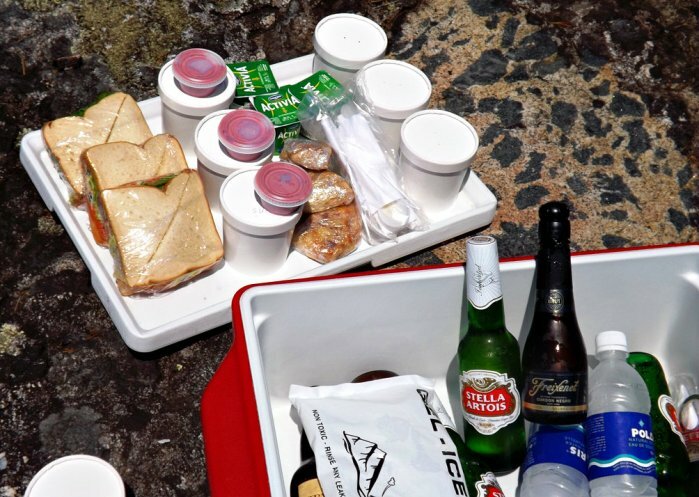 There were smoked salmon and shrimp sandwiches, salad, fruit salad, scones, yogurt and beverages. We even had a small bottle of champagne to toast the newlyweds! It was all delicious. Oh, and I forgot to mention that we were given a snack when we started out. Certainly weren't going to go hungry, that's for sure. After lunch we could either relax in the chairs Kathryn brought along or go for a dip. I chose to swim. The water was refreshing, but quite warm for ocean water :-) It was also lovely and clear and I was wishing I'd brought my snorkeling gear along. We spent about 1 1/2 hours eating, relaxing and swimming at the island and then we continued on. A short distance along we came to some cliffs that went straight up out of the ocean. From here you could look across to the other side of the Sound and see similar cliffs. The goal was to kayak across to the other side and then back along the coast towards the entrance where we were going to be picked up. It looked close, but it probably took about a 1/2 hour to reach the other side. Shortly after we reached the cliffs Michael showed up with the Zodiac and with a little help we clambered aboard, Michael and Kathryn brought up the kayaks and we headed back to the Lodge, arriving around 5 pm. 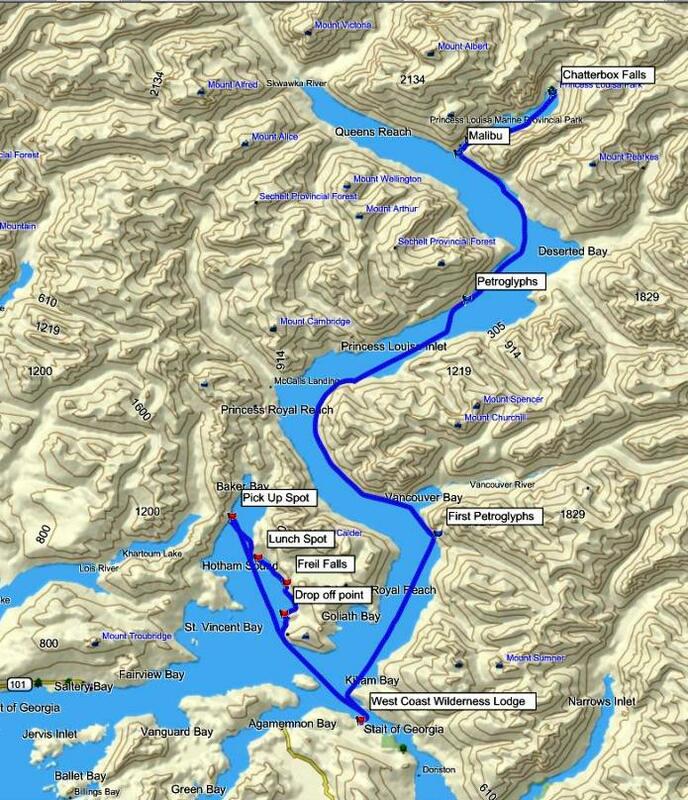 This map shows the Hotham Sound trip as well as the route into Princess Louisa Inlet. 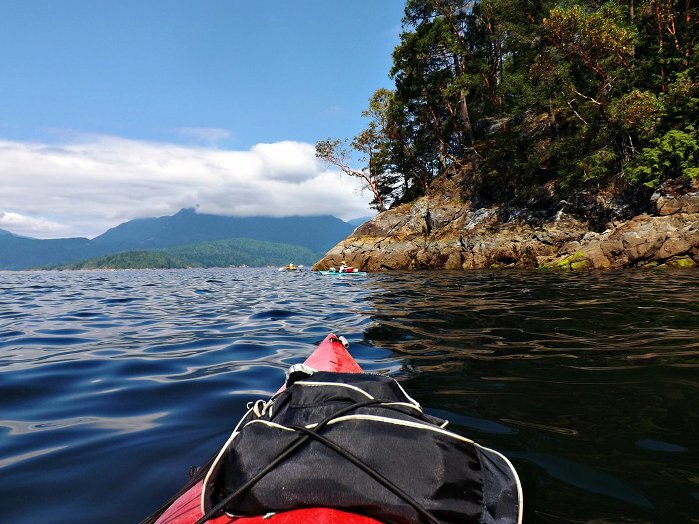 This Hotham Sound Tour turned out to be an ideal way to get back into a kayak. It was such a safe and fun experience, and I highly recommend it. Now all I can think about is going kayaking again! 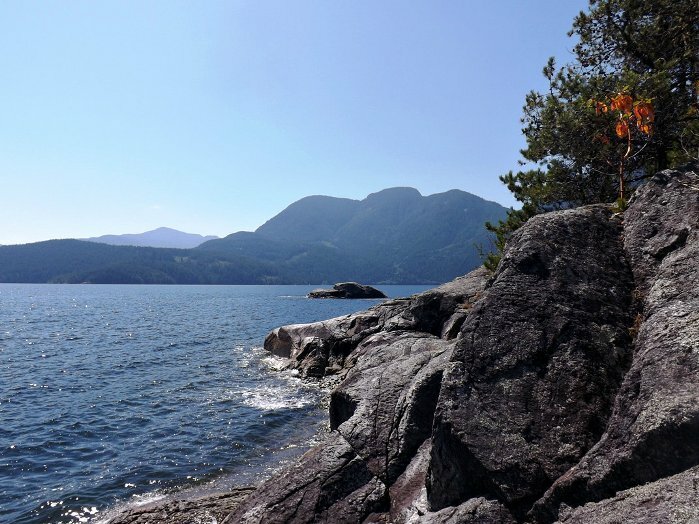 Click here to return from Hotham Sound to the Sunshine Coast Home page.